This post is in partnership with Frito-Lay. As always, all thoughts and opinions are my own. Thank you for supporting the brands that support Fork Knife Swoon! I’ve got a splurge for your weekend! 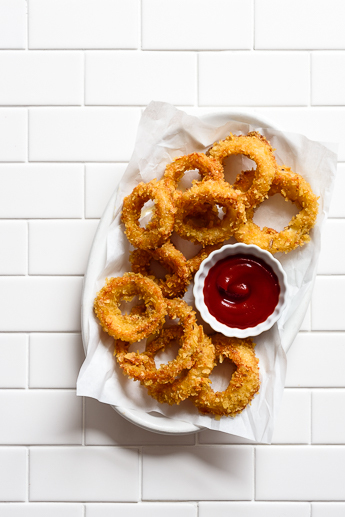 Now that grilling season is upon us, I’m spending lots of time dreaming up all kinds of goodies for our Summer barbecues, and these flavorful, Lay’s potato chip-crusted baked onion rings are the first up. 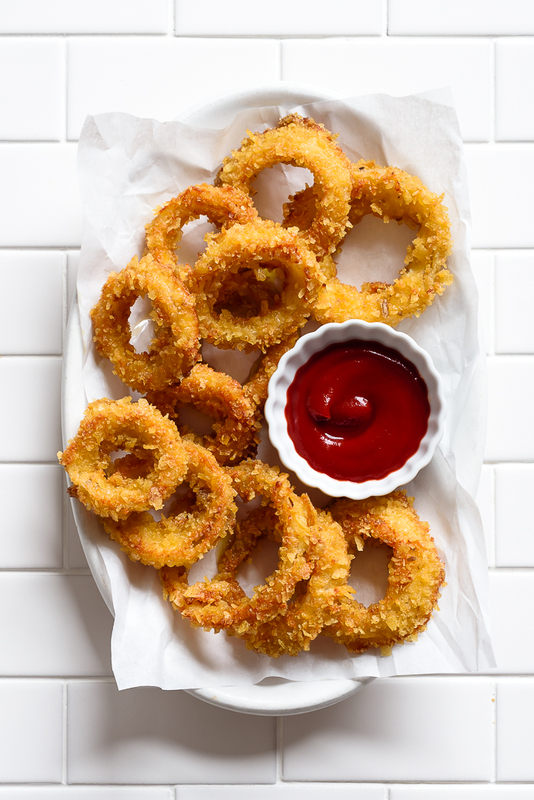 With a crunchy, well-seasoned, potato chip battered crust, and juicy, tender onions at their centers, these onion rings are crispy, oven-fried perfection. Let’s get one thing out of the way. 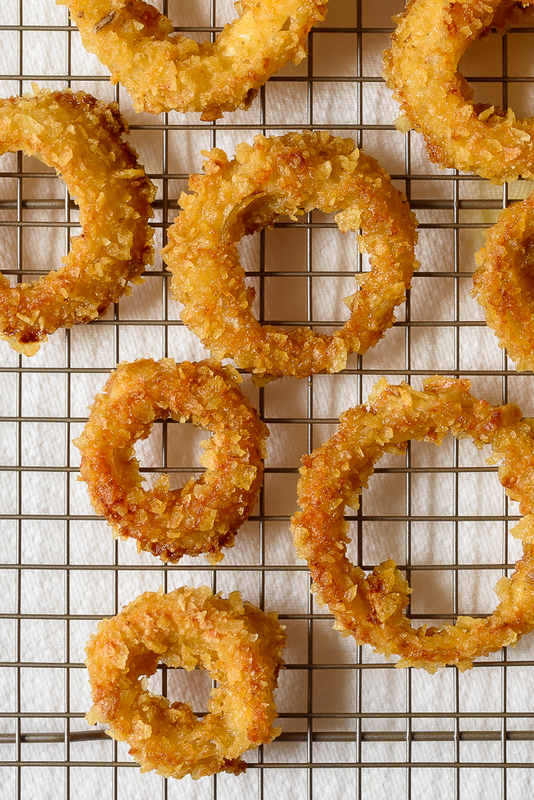 Yes, these onion rings are baked, not fried, and I wouldn’t have it any other way. I don’t especially love frying. It’s messy, and requires watchful attention. It can leave the house smelling like a fast-food restaurant for days, and too often yields overly greasy results. There are certain recipes that demand a fryer (I’m looking at you, raised donuts…), but in this case I don’t miss that greasy pot of oil at all. 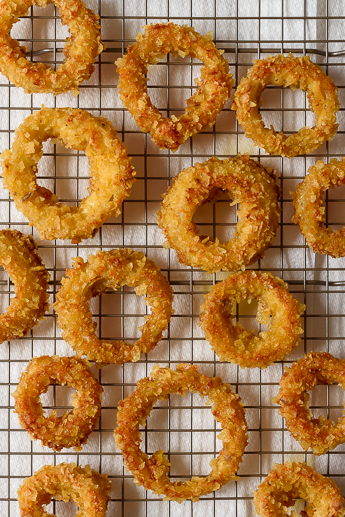 With these baked onion rings, I can pop them in the oven, and nearly forget about them (save for one quick flipping halfway through), until they re-emerge beautifully golden fifteen or so minutes later. The secret is a thin layer of sizzling olive oil in the bottom of the sheet pan that helps these babies in crisping up as they cook. The other secret is using crushed Lay’s potato chips to coat the battered onion rings instead of traditional breadcrumbs. This is the first time I’ve used crushed potato chips as breading, and I can’t believe it’s taken me so long, because they are such a natural fit. Panko (Japanese-style breadcrumbs) is my usual go-to, which is coarser and flakier than traditional breadcrumbs, and results in a lighter and crispier texture (think tempura). But crumbled potato chips work even better here. 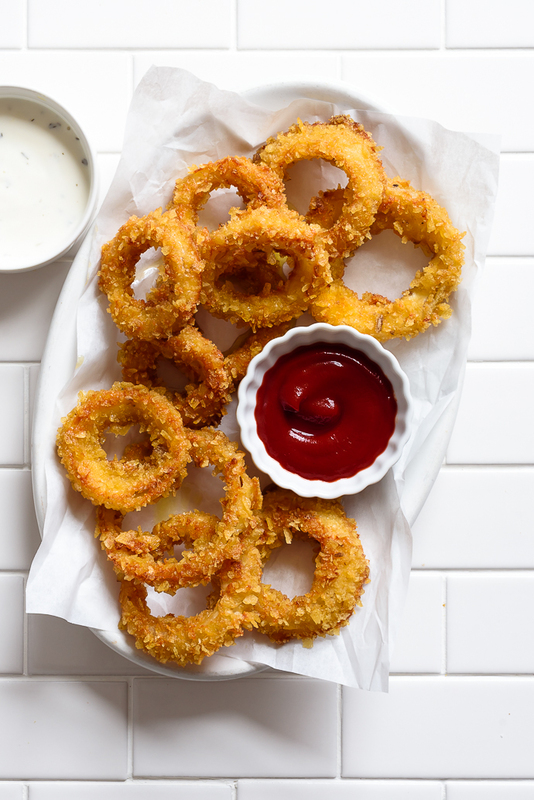 Since they are already cooked – and seasoned – they start out crispy, and quickly get even crunchier in the oven, without absorbing too much oil and ending up soggy, or obliterating the onion within. That balance is key – I love that crunchy outside, but still want to taste the onion within. Potato chip hack for the win! Start with a couple of large, sweet yellow onions. You might find them labeled Vidalia or Walla-Walla. Slice them nice and thick – 1/4 to 1/2-thick rings are best. Next, prep your onion ring assembly line. Get out three large mixing bowls, and line them up. The first filled with flour. The second filled with a yogurt-egg-buttermilk mixture, and the third with crushed Lay’s Kettle Cooked potato chips. 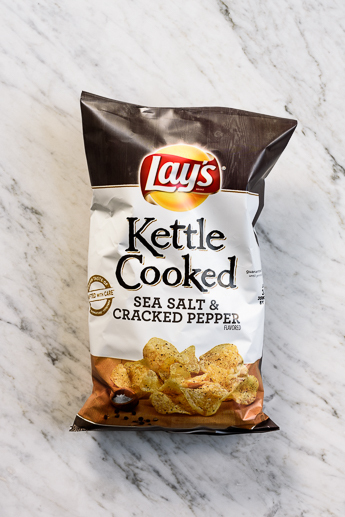 I used Lay’s Kettle Cooked Sea Salt & Cracked Pepper flavored potato chips for these, which are already nicely seasoned, but if you’re using original flavored chips, or want to mix things up, you could add some additional seasoning to the chip crumbles. Salt and pepper, paprika, garlic powder, herbs – whatever flavors you prefer. Then it’s simply dredge, dunk, and roll, down the line. 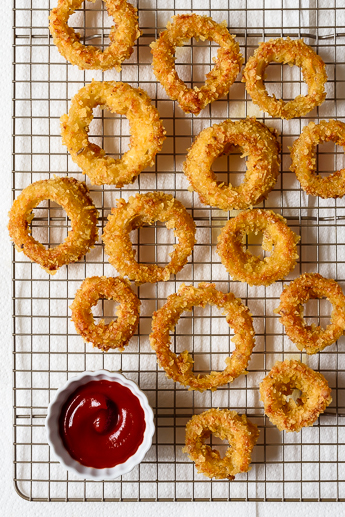 The chip-crusted onion rings hit a pre-heated, sizzling olive oil coated sheet pan, which helps “fry” the rings in the oven while they’re baking. Fifteen minutes later, they’re wonderfully golden and ready for dunking in your favorite dipping sauce(s) and munching alongside your burger! 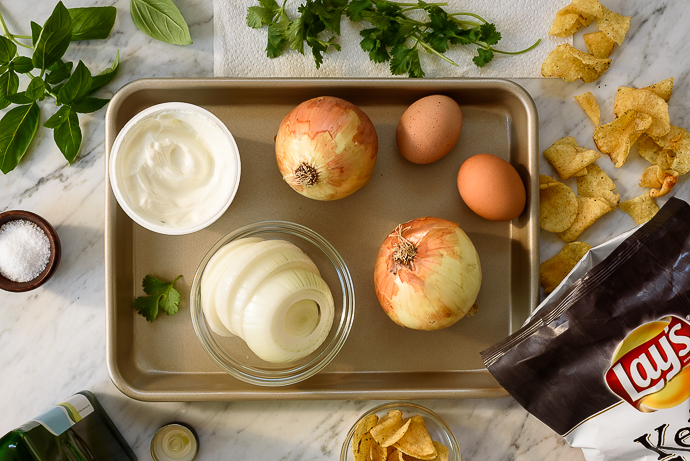 You can find more delicious and unique Summer recipes on Frito-Lay’s Pinterest board. 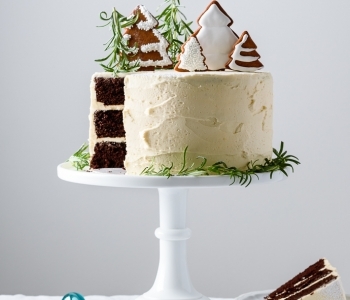 Check out the fun ideas here! Preheat the oven to 425 degrees F. Drizzle the olive oil over two large rimmed sheet pans. Gently roll the olive oil around to evenly coat the bottoms. Set aside. Add 1/4 cup of the flour to a large mixing bowl. Set aside. In another large mixing bowl, combine the remaining 1/2 cup of flour with the yogurt and eggs, and whisk until smooth and completely combined. Add the buttermilk, a tablespoon or so at a time, as needed, until the batter is thin enough run smoothly off the back of a spoon. Set aside. Place half of the potato chips in an even layer in a shallow baking dish. Set aside. Working in batches, toss the onion rounds in the flour, just enough to lightly coat. Gently tap the rings against the side of the bowl to remove any excess flour, as needed. Place the floured onions in the yogurt mixture, flipping to thoroughly coat with the batter, then place on top of the crushed potato chips (3-4 at a time). Scoop the chips up around the sides and on top until each onion piece is evenly and completely covered with chip crumbs. Place the sheet pans in the oven five minutes prior to baking to heat up the pans and oil. 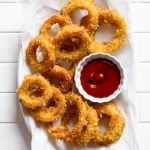 Carefully remove from the oven, place the coated onion rings on the pans, and return to the oven. Bake for 14-16 minutes, flipping once halfway through, until golden brown and cooked through. 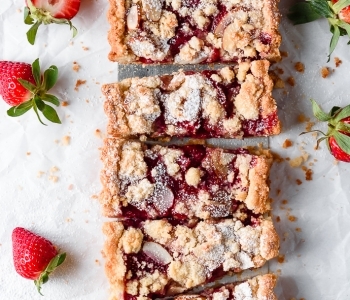 Remove from the oven and transfer to a paper towel-lined baking sheet to cool. Serve warm or at room-temperature with ketchup, bbq sauce or your favorite dipping sauce. Enjoy! 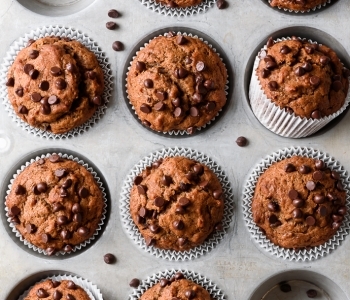 Go gluten-free by substituting a 1:1 gluten-free all-purpose flour mix for the all-purpose flour. You may not need to add the buttermilk if your yogurt is of a thinner consistency. So use your judgement, and if you don’t have buttermilk on hand, feel free to substitute your milk of choice. 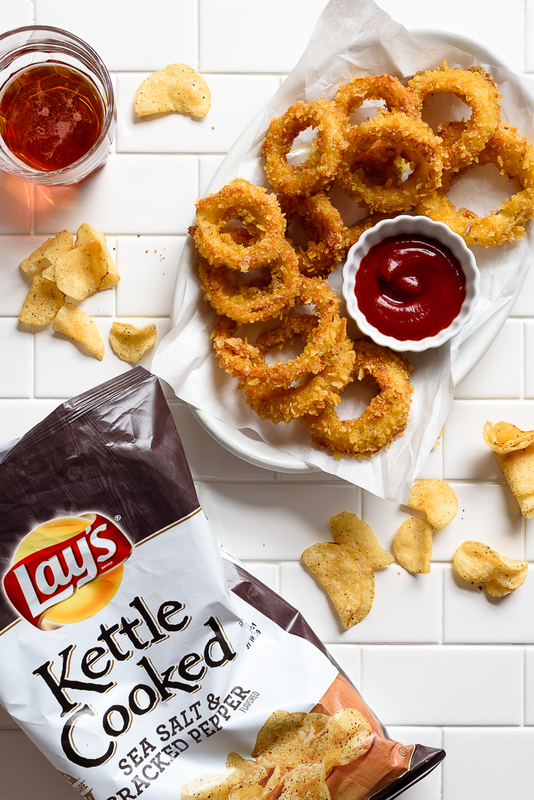 I really like both the original and sea salt and cracked pepper flavored Lay’s Kettle Cooked chips for these onion rings, but you can definitely experiment with different flavors. 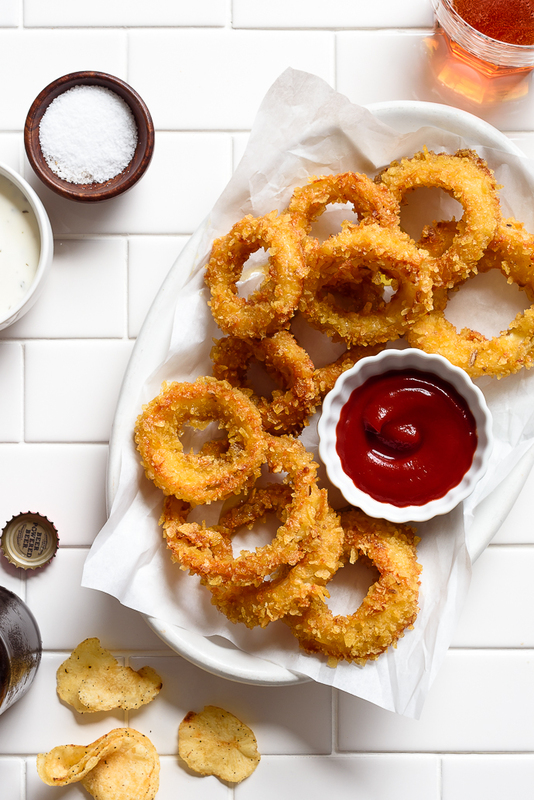 My favorite dipping sauces to serve with these baked onion rings are sriracha ketchup and yogurt-based ranch dressing. What are your favorites?? Um, WHAT! 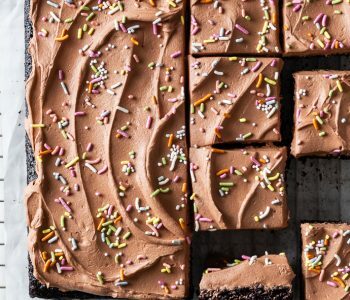 These look amazing – these are happening for dinner!